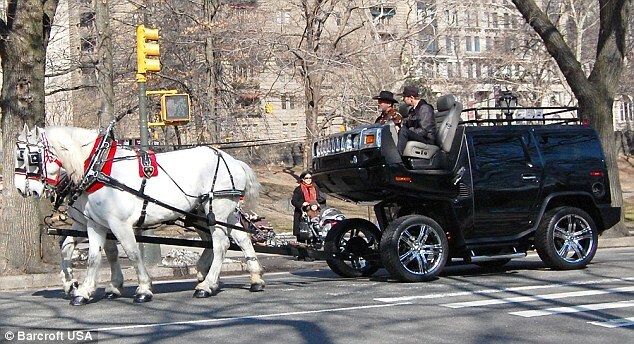 New York artist Jeremy Dean converted a Hummer H2 into a horse-drawn carriage to "show how screwed and unsustainable the auto industry has become." Photo via WagingNonViolence.com. It’s Friday, so let’s have a little fun! See our previous posts in this series here. We never thought this day would come: a sustainable Hummer is here. Just as the demise of General Motors‘ nemesis of sustainable transport unfolded, New York artist Jeremy Dean unveiled his horse-drawn Hummer: an engine-free vehicle with the hood and grille turned upside-down and converted into a coachman’s seat.Mr. Dean calls his horse-drawn Hummer “Back to Futurama,” a reference to the iconic 1985 film “Back to the Future” and GM’s 1939 World’s Fair exhibit Futurama, which depicted a bright future built around cars. Mr. Dean also pointed out that the carriage can be pulled by a human, if necessary, so the two horses pull it with great ease.